Living with Alzheimer’s disease or dementia can be difficult - not only for the person experiencing it, but for the loved ones that surround them as well. 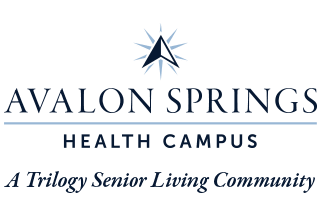 At Avalon Springs Health Campus, we have a specialized team dedicated to turning those challenges into positive moments for everyone. Residents of our Memory Care neighborhood receive the highest quality care from a team who is invested and committed to opening the door to smiles, laughter, and warmth every day. The best Memory Care services are rooted in a clinical understanding of Alzheimer’s disease and other forms of dementia. This is why, in our Memory Care neighborhood, we offer programming such as our Daily Rhythms program, which is supported by national Alzheimer’s advocacy groups. Those with memory loss need a schedule they can rely on. At Avalon Springs Health Campus, we provide this schedule, along with compassion, understanding, and comfort, every day. During a memory loss journey, short-term memories fade, while long-term memories remain. These memories serve as an anchor for those with memory loss, and allow them to experience moments of joy. Creating these special moments is something we’re passionate about at Avalon Springs Health Campus. Here, one-time fishermen can find themselves back on the water, cooks can lend a hand crafting family recipes, and music lovers can feel the way they felt on the dance floor, all those years ago. Each moment is a chance to bring a smile to the faces of those we serve, and we make every moment count. Learn more about our Memory Care services by contacting a member of our team today.